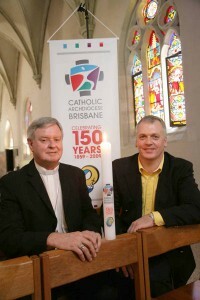 ARCHBISHOP John Bathersby will launch a year of celebration this weekend for the sesquicentenary (150 years) of Brisbane archdiocese. Archbishop Bathersby will launch the year today (November 30) as he celebrates Mass in St Stephen’s Cathedral, Brisbane, for the first Sunday of Advent. His Advent pastoral letter for 2008 focuses on the sesquicentenary and the opportunities it offers. In the letter, Archbishop Bathersby notes that the year is also significant for the Anglican Church in Brisbane, whose diocese was established in the same year, and for Queensland and Brisbane that, until 1859, were part of New South Wales. “The year therefore is enormously important because it gives us an opportunity as Queenslanders to celebrate the establishment of our state, and to thank God for God’s many blessings over the past 150 years,” he said. Archbishop Bathersby said the year 2009 would give Catholics and Anglicans “a marvellous opportunity to make a fresh start in spreading our faith throughout our archdioceses, in our own particular case building upon the two most significant events that have shaped (the archdiocese) over the past 50 years – the Second Vatican Council (1962﷓65), and our own Archdiocesan Synod in 2003”. Each parish in the archdiocese has been invited to send a representative to the 10am Mass today when the Archbishop will launch the sesquicentenary year. At the end of the Mass, the representatives will receive a commemorative 150th anniversary candle to take back to their parishes. Archbishop Bathersby said in his pastoral letter that he hoped all in the archdiocese would participate as fully as possible in the events of the sesquicentenary.